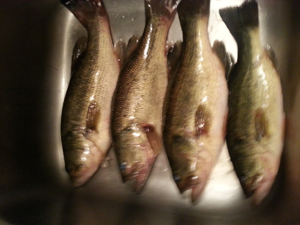 I went Tuesday water was up slightly higher than I like, but I caught my enough bass and kept 5. 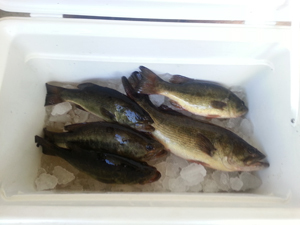 I went Friday and I caught slightly bigger bass and only kept four. The reason why I kept little ones I used a Rebel wee r and good thing catches fish. Bad thing about rebel wee r is that the bass choke it down to point it basically kills them. I tried bandit 1000 series smaller bandit that silent did well, rebel wee r, and 100 series bandit, bagley 1” crankbaits in shad color that was ticket. Found all bass off points or runouts. Back of dead ends you can catch all the gar you want on crankbait, but not gar guy. Now I did try my frog areas and they were full of scaliat I was disappointed looks like sharp points is the ticket. 1st pic Tuesday – smaller but had keep a few that Rebel wee R get caught in back of throat of bass. 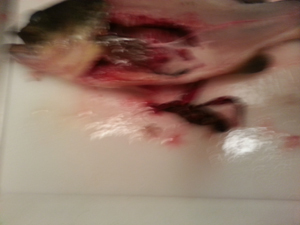 Bass were hitting 1” small shad due to stomachs were full and all these bass came off same point. I am pretty much done with spillway. Once I get my battery charger in this time I went with a Dual Pro I will start crankbait and Carolina rig deep for old river bass. Sometimes old river I go to flats to North with stumps in water that go out far and bump bigger crankbaits off stump just got to watch it.